When catastrophic disaster strikes, food quickly becomes an issue. Recovery Logistics addresses this need with complete meal solutions. We offer fully staffed kitchens who prepare and cook meals directly on site. And we’re not talking about SPAM® here, these are whole meals that keep the crew working productively. 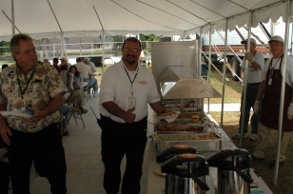 We also arrange off-site catering services that provide high quality meal options. It’s important to keep everyone well nourished during a disaster recovery operation. We make sure it happens.